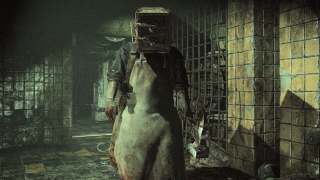 The Evil Within is filled with all sorts of unpleasantness, and it's not just the belligerent inhabitants of the Krimson City mental asylum that make it so. The game world itself is a nasty place, filled with puzzles and fiendish traps that will end your day in a squishy hurry. "Exploration has its rewards," the narrator of the new trailer intones. "Extra ammunition and green gel are sometimes stashed in dwellings just out of sight." You know what else is sometimes stashed just out of sight? Homicidal maniacs with chainsaws. And while sometimes you can come out on top in such encounters, there will also be times you can't. Those giant spikes shooting up from the floor? Can't stab them in the back of the skull. Nor are you going to shoot your way past the giant egg-beater. These are problems that will require a somewhat more cerebral approach. "While combat is constant throughout most of the campaign, challenges come in all forms. Not all threats present themselves in the form of fights with waves of Haunted; some obstacles are sneakier, more insidious," Bethesda wrote in its latest blog update. "Always look to your environment and inventory to find all the ways to approach combat. What may seem impossible at first may just mean you have to be more clever in how you manage and use the resources provided."